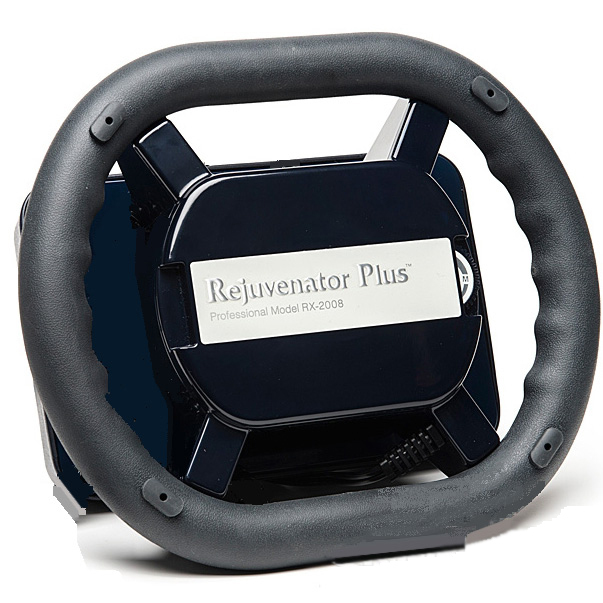 The Rejuvenator Plus is a professional master massager offering the most powerful, therapeutic and deeply penetrating orbital massage we could find. The versatility of this massager makes it perfect in a clinical setting; offering effective pain reduction and relief of muscle spasms in the spine, hips and legs. 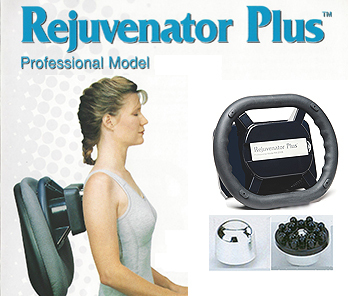 The Rejuvenator Plus is also great for home use, especially trading massage sessions among friends and family members. For administering treatment to oneself, there are some easy ways to position the Rejuvenator for a soothing self-directed massage, right down to the soles of your feet. Large Built-in Pad: the anatomically designed large pad fits the body contours and may be used without attachments for effective, relaxing swedish massage, on all body parts. This is facilitated either by clothing, or by placing a thick bath towel over the person receiving a massage. 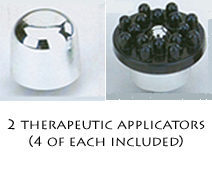 Reduce Muscle Spasm and Relieve Pain: the smooth, bell-shaped massage heads are recommended and may be used to create a deeply penetrating orbital wave at a frequency that overwhelms a muscle's ability to spasm (this is mediated via the "muscle spindle" & "Golgi tendon apparatus" response). Dissolves Trigger Points: utilize the acupoint applicator attachments running at almost 4000 cycles per second to target trigger points with a laser-like focus; thereby pumping away toxic metabolites that perpetuate such trigger points. Fantastic for Backs, Shoulders, Hips, Buttocks, Thighs, Calves and Soles of the Feet: Use contoured built-in pad or preferred massage applicator head. Arthritic and Stiff Joints: may be carefully applied to the muscles surrounding stiff spines, hip or knee joints; whether related to old injuries and/or osteoarthritis. Relaxes, Invigorates and Dissipates Soreness: making it great for overcoming fatigue or reducing post exercise delayed onset muscle soreness. Excellent for Sports' or Overuse Injuries: Rejuvenator is really beneficial for recovery from the fatigue & soreness of overuse or exercise injuries. Reduces and Helps Eliminate Tension Headaches: related to contracted fibers of the upper & middle trapezius muscles of shoulders and midback. High-frequency Orbital Massage: has been proven to reduce tension, rejuvenate vigor, and restore health. Gentle Swedish Massage Option: the slightly curved massage pad (i.e. w/o attachments) works wonderfully for those that are very sore and just want an extremely soothing and/or relaxing massage. Anti-vibration User Handle: the rounded grip, oval handle offers ergonomic stability, massage application control and less transfer of vibration to the user (masseur or masseuse). 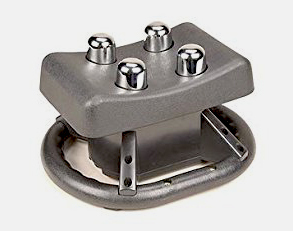 When turned upside down on the floor, handle makes a stable base to facilitate a great foot massage. Multi-functional and Versatile: may be used on almost all muscular areas of the entire body. High Quality and Durability: care has been taken to ensure excellent performance through time-tested design and quality workmanship. LIFETIME WARRANTY: covering parts and service under normal use to original purchaser only. Customer will be responsible for any inbound or outbound ship costs. Original order receipt issued from Back Be Nimble must be provided. Decision to repair or replace is at the sole discretion of Back Be Nimble. Therapeutic Orbital Effect: concentric oscillations at 4000 cycles/sec are created by the powerful 40W motor; keeping the massage smooth and comfortable, while offering a deeply therapeutic session. Variable Massage Intensity: massage intensity or speed of oscillation is freely controlled by the Speed Dial. Depth of massage penetration may be varied by applying harder or softer pressure. 7 ft. Power Cord: offers sufficient reach for a convenient, successful massage. SAFETY TESTED MODEL--BEWARE OF MODEL MADE IN MAINLAND CHINA: please note that we offer the exclusive NEW, safety-tested model; with enhanced wiring and circuitry that prevents overheating and electrical fire hazard seen in a less expensive Chinese model under the same name. Unlike the mainland China imposter, sold for less cost on other discount and auction sites, our model made in Taiwan has a proven track record for safety and quality. Taiwan manufacturing focuses on high-tech and quality because they cannot compete with low pricing resulting from cheap labor in mainland China. LIFETIME WARRANTY: covering parts and service under normal use to original purchaser only. Customer will be responsible for sending the unit back to us for warranty service at their expense. Original order receipt issued from Back Be Nimble must be provided. Decision to repair or replace is at the sole discretion of Back Be Nimble and customer must pay a $25 shipping fee to cover the cost of shipping the serviced unit back to them. RETURNS: 30-day money back guarantee. Customer will be responsible for returning the unit in new, resalable condition with all original included instructions and accessories. SHIPPING WEIGHT/DIMENSIONS: 10 lbs. / 12 in. x 12 in. x 10 in.